AMOUVE – Bangalore based startup providing Luxuriously soft organic cotton bedding for great sleep. Passionately crafted organic home textiles to transform your slumber zone into a sophisticated and relaxed personal sanctuary. This Startup Amouve based in Bangalore, India provides lots of organic bedding products for better sleep like bed sheets, Pillow covers, Cushions, Quilts and many more. We know you want to know more about this Startup. We have shared below their complete story about this unique and creative idea. We have asked several questions from the founder Ami Sata about this startup and she had replied tremendously about the idea and the complete setup of this Business. 1. How did you get the idea of Amouve? What’s the story behind it? When I visited Sweden, I experienced the most sumptuous sheets I had slept on. While trying to find the same quality in big-box retailers in India, I was left disappointed. Firstly, there was no existence of organic sheets at the retail level. All conventional cotton sheets were marked with inflated thread counts and felt like sandpaper. To add to this 100% cotton labeled on the packaging did nothing to talk about the fiber quality or the chemicals that went into it. Upon researching, I realized that conventional cotton is full of pesticides and other potential carcinogens like formaldehyde. Digging further, I was shocked to know that the average life of the cotton farmer was 35 years on account of the use of pesticides and purchase of GMO, patented seeds. Bt cotton has long failed our farmers with more than 3 lakh farmer suicides since 1995. This further cemented my belief that organic (free of any toxins from farm to fabric) was the way forward. It was brought to life with a range of bed sheets, quilts and comforters that were a combination of Scandinavian Minimalism and hand-block prints inspired by travel, from Morocco to Colorado, Iran to India among others. 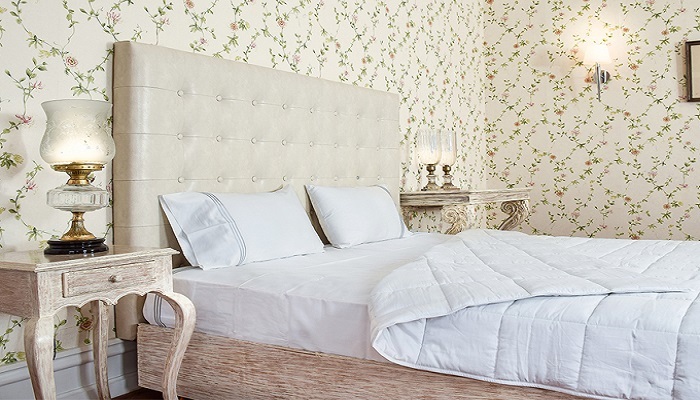 Thus Amouve, an amalgamation of super-soft sheets and a discerning design aesthetic came into existence. 2. What is the USP of the brand? “Amouve is a concoction of two French words, ‘amour’ meaning Love and ‘reve’ meaning dream. Hence it stands for ‘the love of dreams’. That’s what we wish to do — manifest dreams for consumers in the form of soft, natural sleep, for farmers by giving them a respectable and debt-free livelihood, and for the environment through sustainable practices.” This is what sets us apart. Amouve is the first-of-its-kind, direct-to-consumer, GOTS certified organic bedding brand in India. The idea is to provide a luxurious and honest sleep experience at an affordable price. Amouve markets what exists. Its sheets use only single-ply yarn threads that last longer and feel smoother than multi-ply threads being sold by most in the market today. Also, they are anti-pill and get softer wash after wash because they are made of unbleached organic cotton. Not to forget, Amouve offers a hassle-free shopping and shipping experience. Further, talking about the benefits of organic cotton, they are immense. When you choose bedding made up of organic cotton, you eliminate a multitude of chemicals. It will not expose you to pesticides, herbicides, formaldehyde and a number of other chemical residues, commonly found in conventional cotton. Many of these chemicals are carcinogenic and skin irritants. VOCs or Volatile Organic Compounds found in conventional cotton are inhaled as vapours during sleep and interrupt with our sleep pattern. Pesticides are also potential endocrine disruptors that cause adverse developmental and reproductive problems. On the other hand, organic cotton is free of toxins, from farm to fabric. More importantly, it feels extremely soft. Consumers should look out for GOTS or the Global Organic Textile Standard, the most rigorous standard for organic textiles. From the environmental perspective, organic cotton is a saviour as it doesn’t deteriorate the soil, river basins, biodiversity and the health of farmers and workers. 3. Who is the brand for? We stand for super-soft, honest, toxin-free sleep and luxury with a conscience. Amouve is for those who have a global outlook and pride themselves in being undeniably Indian. Our audience understands references well, be it a certain name, color or design aesthetic. Amouve brings these at their doorstep. Amouve is a completely ‘Made In India’ brand that caters to an urban taste. It reflects simple, refined luxury with a conscience, combining honesty and ingenuity of craftsmanship and processes. We seek to change lives by changing sheets. We’re all for people and processes. The idea behind Amouve is to cut down on offline rentals and middlemen margins so as to pass on the cost benefit to the consumer. Therefore, Amouve sells through its own website www.amouve.com, By retailing online, we are able to offer luxury bedding at affordable rates because we are not paying money for slotting products on store shelves. Also, by being a single point of contact directly with consumers, we are able to keep strict quality checks that make buying bed sheets online a hassle-free process. We may explore the opportunity for affiliates who fit with the brand synergy in the future. 5. Shed some light on the collection and the designs of the products? Amouve’s range includes bed sets as well as comforters, quilts and linen cushion covers. Bed sets comprise of the Everyday Luxury collection with classy, minimal sheets in different colors whereas the Lyric Collection comprises of hand-block prints inspired by travel. For eg, Morocco’s eclectic vibe reflects in the Moroccan Musings Collection while Angkor draws from the stone ruins in Cambodia. While the magnificence of the red mountains of Colorado finds itself in the ‘Colourado’ collection, the beauty of the Mughal gardens in Kashmir is embedded in Haminast. A lot of these are from my own travel experiences. The personality and character of places blows me away and intrigues me to a point where I find it necessary to reflect them through the designs. Each of them is a labour of love and takes several days to come to life. Our quilts, for example, undergo 7 different processes and take an average of 45 hours to craft. Our Everyday Luxury white sheet set remains my favorite since I love the color and its simplicity. 06. How has the response been so far? Very encouraging. Thankfully all the effort that has gone into building Amouve has seen appreciation by customers in all forms – from the product to the shipping. As more and more people get to know about the ill effects and underbelly of the cotton industry and the benefits of organic cotton to their sleep as well as to those associated with making the product, there is a shift in attitude and buying behaviour. I see it picking up gradually to a much larger scale. 07. What’s the way forward? Next in line for both you and the brand. More line extensions and a wider gamut of organic sleep products. We are focused towards increasing consumer awareness in the segment and building a sustainable business model for all stakeholders. In the process of getting the healthiest and purest form of bedding products to our consumers, we are equally dedicated to uplifting the dire conditions of cotton farmers and factory workers in the country by providing the right pricing and fair wages to them. We are working towards inclusive growth in this bedding sector. Ami Sata is the founder of Amouve. With a bachelor in media and a major in branding and advertising, she was alway inclined towards using her skill set for her own venture. Prior to starting Amouve, Ami worked for a bedding brand that helped her understand the nuances in this sector. Previous Previous post: Geeta Phogat: The real inspiration for everyone.